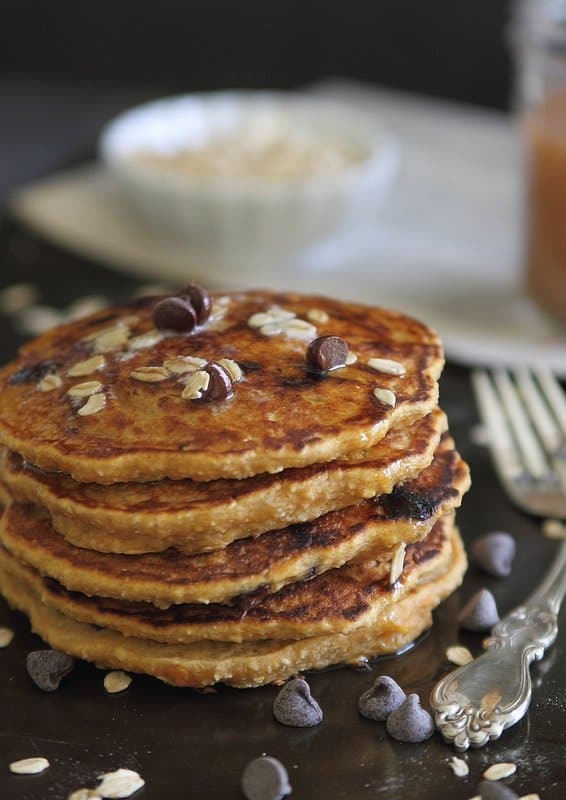 These hearty oat based sweet potato chocolate chip pancakes are the perfect balance of a healthy and decadent breakfast! Lazy Sunday mornings are probably my favorite time of the entire week; sleeping in until at least 9am (ok, more like 10), moseying downstairs in pajamas, getting the pot of coffee brewing, starting on a breakfast that weekdays don’t afford the time for and hopping under a blanket on the couch after breakfast to sip coffee and read/peruse social media/play words with friends. I am not that person that wakes up early to cram more hours into their weekend day to enjoy. I can’t even pretend to understand those people and their crazy early morning antics. 6am wake-ups on a weekend are just wrong. Even Ginger gets it and doesn’t get up until she hears us moving around on a weekend morning. So this is all well and good except for the fact that in 3 weeks we’ll be moving in with the epitome of “morning people”: my parents. They are those crazies that habitually get up before the sun and with 3 dogs that follow suit. On an average of 4 or 5 times a week, there will be multiple text messages on my phone from my mom before I even wake up. No more lazy Sunday mornings for awhile. I do have one thing in my back pocket though, bribery with sweet potato chocolate chip pancakes. I’m thinking she might just let me sleep in if I play that card. My love of pancakes is well documented on this site (click that link to see all the recipes – there’s over 25 of them!) so if I make one recipe a weekend I should be able to buy myself half a years worth of weekend sleep-ins. Definitely going to try these orange basil ricotta pancakes, these banana nutmeg pancakes and these oatmeal pumpkin pancakes first as I know mom will love those. Dad will be more into the peanut butter chocolate chip pancakes or the savory Canadian bacon pancakes. And then there’s me, who prefers the classic protein pancake or the pumpkin counterpart – pumpkin protein pancakes because those recipes keep me full until lunch! I love to batch cook sweet potatoes, peel them and then freeze them in a freezer safe bag for baked goods. That way, when I want to make recipes like these sweet potato chocolate chip pancakes, these sweet potato bars, this sweet potato raisin bread or whole wheat sweet potato banana muffins I’m ready to go and don’t have to add in the prep time of cooking the sweet potato. It’s an easy tip that’ll save you a ton of time because no one wants to prolong the wait between you and a stack of these delicious sweet potato pancakes on a lazy weekend morning! I have to say, breakfast plans are looking good for the next few months! 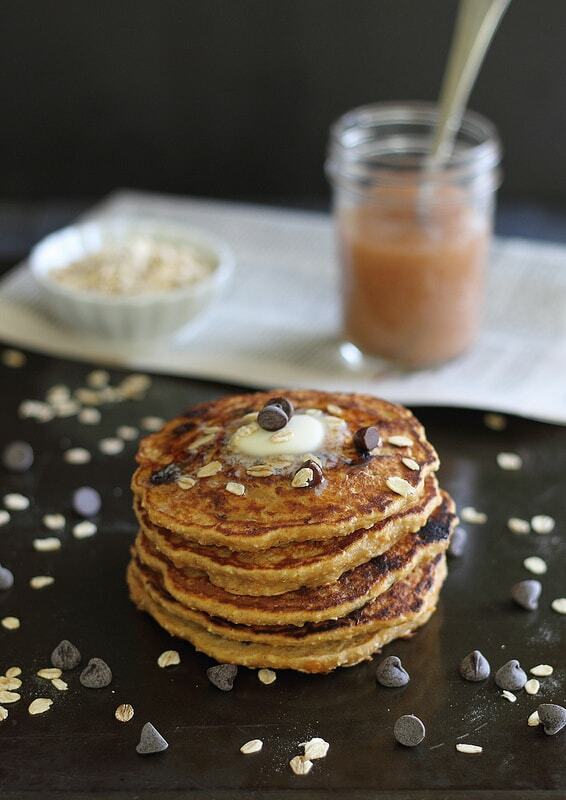 These hearty oat based pancakes are the perfect balance of healthy and decadent with both sweet potatoes and chocolate chips! Combine all the wet ingredients in a medium bowl and whisk together. Combine all the dry ingredients except the chocolate chips in a large bowl. Add the wet to the dry ingredients and mix until fully incorporated. Fold in the chocolate chips. The batter will be a little thick and might need some "help" pouring. Grease a griddle pan over medium heat and pour the batter to form a pancakes about 5 inches in diameter. Cook for about 2 minutes and then flip and cook about 1 minute on the other side. *you could substitute pumpkin puree for the sweet potato in this recipe just cut back the milk to 1/2 cup. I have never used sweet potatoes in a pancake recipe.. yummy! LOVE cooking and baking with sweet potatoes. Pumpkin gets the spotlight, but these orange guys deserve love too. Hang onto those lazy days as long as you can! Before I even saw the pictures or read the post I saw the Title and literally went “oh my gawshhhh” Sweet potatoes and chocolate chips? In pancakes? Yes please! I love lazy weekend mornings too especially when there’ s a plate of pancakes involved! Sweet Potatoes in pancakes! GEnius! I have a love affair with sweet potatoes, I always have them on hand and eat them every week! Definitely going to need to try these! I’m also really big on lazy, long Sunday mornings. I love taking my time to eat breakfast. And these pancakes are on my menu for this Sunday. They look amazing! I am sweet potato obsessed, and the chocolate chips are just the icing on the cake! Also, that King Arthur white whole wheat flour is my very favorite too–so great in all baked goods and pancakes! Isn’t it?! I’m totally in love with it lately. Sweet potatoes and chocolate?! Two of my favorite things! These looks like a perfect weekend breakfast! I am shoveling these into my mouth with a side of chorizo. Great recipe! These are delicious, but my cooking of them is an issue – they are staying raw in the middle, and burning slightly on the outside. Ive tried turning up and down the heat, still takes a really long time to cook, and when i try to flip them they are mushing up and smearing across the pan. I’m sure its me, a novice, impatient cook. I may also have put in slightly too much coconut oil – 1 1/2 T.
A couple things… First, follow the recipe as written and use 1/2 tablespoon of coconut oil, not more. Also, make sure the pan is preheated well and greased well. The temperature should be about medium, not too hot, not too cold but it must be preheated well when you first put the batter on. Since the batter is thick, make sure you’re spreading it with a spoon or spatula into an even pancake shape and not leaving it too thick. Let them cook thoroughly on one side before flipping. About 6 depending how big you make them. The recipe serves 2.